If you shop at Whole Foods regularly, you’ve most likely found the bread selection to be somewhat lacking. The bread isn’t bad if you’re in a pinch, but most people – myself included – go elsewhere for crusty artisan loaves. But the store’s new SweetWater 420 Extra Pale Ale bread is worth seeking out. Whole Foods has partnered with Atlanta’s own SweetWater Brewery (located in Midtown) to bake this special bread at the Whole Foods’ bakeshop in Alpharetta. 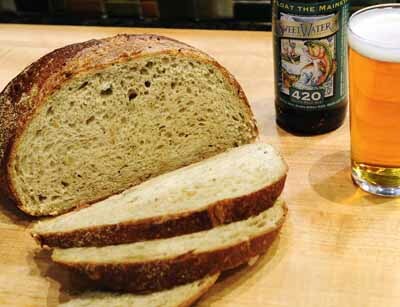 The bread is made with the spent barley grains of SweetWater’s 420 Extra Pale Ale. The crust on each loaf is as dark as molasses and crackly even days later (the loaves have a long shelf life despite having no preservatives). We found this bread the last time we were in Atlanta and just fell in love with it. Delicious. I want to try making a batch at home so that I can try it fresh out of the oven, if I can figure out the proper recipe.